The U.S. president’s unpredictability and Twitter outbursts have inevitably engendered quite a lot of market uncertainty, which, as you know, investors don’t like. This has prompted several big-name hedge fund managers to weigh in. One such manager is value investor Seth Klarman, who oversees $30 billion as head of Boston-based Baupost Group. He tends to be media-shy, but Klarman is no slouch. In the last 34 years, he’s lost money in only three. He’s one of the very few money managers to receive open praise from Buffett himself. Anyway, in his annual letter to investors, Klarman raised concerns that Trump’s protectionist policies and deep tax cuts could seriously hamper economic growth, both domestically and abroad, by isolating the U.S. from global trade and adding significantly to the already-bloated national debt. “Exuberant investors have focused on the potential benefits of stimulative tax cuts, while mostly ignoring the risks from America-first protectionism and the erection of new trade barriers,” he wrote. You can read more of Klarman’s letter over at Andrew Ross Sorkin’s DealBook. Even for some money managers who were initially excited by Trump—Ray Dalio and Jeff Gundlach among them—reality is beginning to set in. Last year, central bank policy and negative real interest rates drove the gold rally. This year, it seems to be uncertainty over Trump and other antiestablishment leaders, which is convincing the smart money to make wagers on the yellow metal, often seen as a safe haven during shaky times. So far in 2017, it’s up close to 7 percent, compared to the S&P 500’s 2.6 percent. In fact, if you compare this year’s price action to last year’s, they look remarkably the same, with a dip in December before the Federal Reserve raised rates. 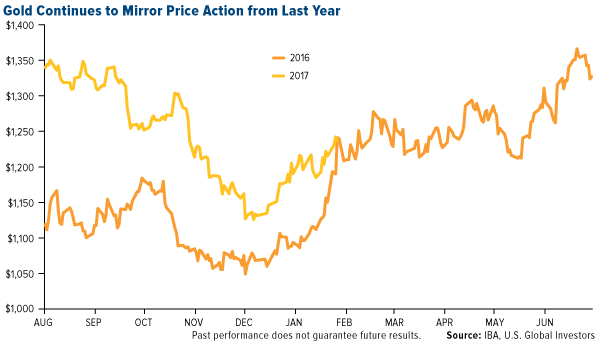 Although past performance is no guarantee of future results, gold could gain another $100 an ounce this year if it continues to follow the same trajectory. Higher demand has been good for both junior and senior gold miners, which recently crossed above their 200-day moving averages. The NYSE Arca Gold Miners Index was up for an incredible seven straight days ended Monday, while the MVIS Global Junior Gold Miners has made positive gains in eight of the nine previous days. 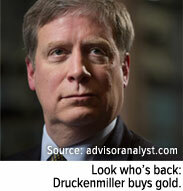 Hedge fund managers aren’t the only ones whose demand for gold is strong. For the sixth straight year, central banks continued to be net importers of the metal in 2016, with China, Russia and Kazakhstan leading world consumption. 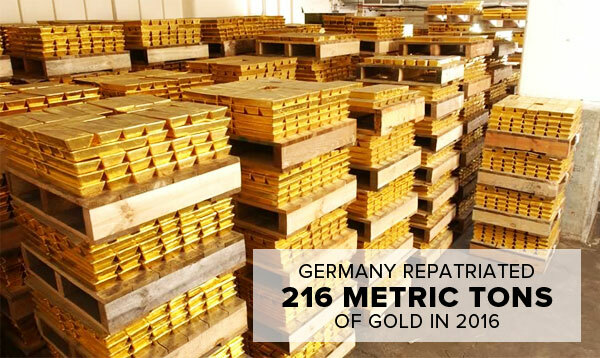 Although it might not have purchased any gold in 2016, the Deutsche Bundesbank, Germany’s central bank, ramped up its repatriation program, bringing home some 216 metric tons from vaults in New York, according to the Wall Street Journal. In 2011, former Fed Chair Ben Bernanke said central banks held gold simply because it’s tradition. I think the reason goes much deeper than that. Gold is money—it has been ever since the first gold currency appeared in China more than 3,000 years ago—and Germany’s efforts are proof of that. Next Article Will gold and silver also be victims of EU war on cash?